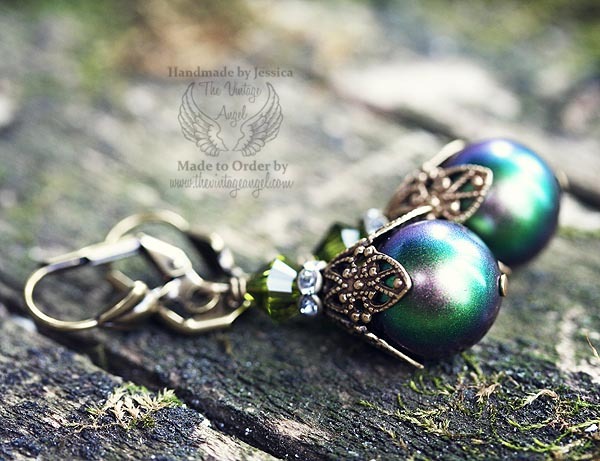 So enchanting with Swarovski pearl rounds in the most magical two tone shade of green and purple, this pair of vintage inspired earrings will become your favorite. Large Swarovski pearls (12mm) are embellished with lacy filigree antiqued brass bead cap accents, rhinestone rondelles and garden green Swarovski crystals. Hung from antiqued brass leverback hooks. Very lightweight. 1.5 inches long including hooks.